Britain’s biggest tobacco firm has turned to the wine industry for ideas on how to give its cigarettes some cachet. 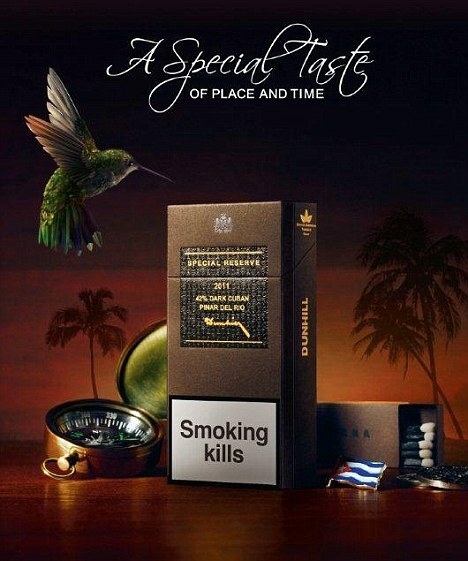 British American Tobacco is bringing out premium packets of Dunhill cigarettes, containing details of the lineage of the leaf used, along with the year of harvest. Its aim is to create a market in limited edition vintage cigarettes, similar to that found in fine wines. The packets could prove controversial among health campaigners, who may claim it is an attempt to glamorise a product that can kill. After a 25-year battle, smoking is essentially banned on all airline flights beginning and ending in the U.S. when President George H.W. Bush signs legislation that make it through Congress despite fierce resistance by legislators from tobacco states. Technically, the new law forbids smoking on any domestic flight lasting less than six hours–which means only 28 out of 16,000 flights are exempted, mainly non-stops to Hawaii. It replaces a previous law banning smoking on U.S. flights lasting under two hours. It’s seen as a big victory for health advocates and flight attendants, who had long complained about all the second-hand smoke they had to breathe in. A turning point in the debate, in fact, had been a National Academy of Sciences report in 1986 which had found that flight attendants typically were exposed to the same level of second-hand smoke as someone married to a person who smoked a pack a day. By the mid-1990s, airlines began adopting no-smoking policies that applied worldwide, beginning with Delta in 1995, and followed two years later by TWA, United and American Airlines. Air France, British Air and Virgin Atlantic followed suit in 1998. When, in 2000, President Bill Clinton signed a law officially prohibiting smoking on every flight into and out of the U.S., it was a mere formality. More recently, companies selling electronic cigarettes, which emit no smoke, began promoting them as devices that can be smoked anywhere–including on planes. And technically, they were right–the existing law doesn’t actually prohibit them. But none of major airlines is allowing e-cigarettes to slip through that loophole. For now, their position is that faux cigarettes are no more welcome on their planes than the real thing. Interested in kicking your nicotine habit? The Athens City-County Health Department may be able to help. The third Thursday of November marks the American Cancer Society’s Great American Smokeout, an event designed to encourage smokers to quit — or to plan to quit — their use of tobacco products that day. “By doing so, smokers will be taking an important step towards a healthier life — one that can lead to reducing cancer risk,” said Kim Knapp-Browne, the agency’s tobacco education and prevention coordinator, in a news release. What does it take to participate? Simply a personal commitment to quitting, said Knapp-Browne. Those needing a little guidance can go to O’Bleness Memorial Hospital’s Willow View Cafe lobby on Nov. 21 between 11 a.m. and 1 p.m., where Knapp-Browne will be answering questions and giving away free resources like Quit Kits and stress balls. The Ohio Tobacco Quit Line, 1-800-784-8669, is another resource. In February, O’Bleness Health System will be offering free classes utilizing the American Cancer Society’s Freshstart smoking cessation program. For more information call (740) 566-4800 or email stopsmoking@obleness.org. Businesses even offer cessation services, and so Knapp-Browne recommends checking with an employer, too. While statistics in Athens County suggest the rates of smoking traditional tobacco products (cigarettes and chewing tobacco) are going down, the biggest concern now is with electronic cigarettes, Knapp-Browne said. Electronic cigarettes, also known as e-cigarettes, are battery-operated devices designed to deliver nicotine, flavor and other chemicals. Tests have shown some e-cigarettes have toxins such as diethylene glycol, an ingredient used in antifreeze, according to Knapp-Browne’s research. The products are fairly new and are not FDA approved or regulated. While smokers believe e-cigarettes are safer than conventional products, not much is known about their safety or if there is any benefit of using them. Only recently have there been research published related to e-cigarette use, Knapp-Browne said. There are now 3.5 million e-cigarette users in the U.S., according to research conducted by the Tobacco-Related Disease Research Program located in California. They’re expected to surpass the consumption of conventional cigarettes by 2023. Because the products are so new, there is no proof the vapor is safe for the person smoking or for those who breathe the secondhand vapor, according to the release. According to a study called “Electronic Cigarettes: How Will They Impact Human Health,” stem cells were sensitive to the fluids and vapor, indicating pregnant women should avoid using and exposure to e-cigarette vapors. There are no federal age restrictions preventing children or teens from buying them, nor are there advertising restrictions. More than 76 percent of high school students are dual users, meaning they use both regular and e-cigarettes.